← Watch Dave Ramsey and His Daughter Live Tonight! This all matters a lot to me because I have relatives and one friend who have died from diabetes and the complications associated with it. I don’t want that to happen to me. I want to be able to hike to a mountain peak with my grandchildren and great grandchildren when I turn 90! That’s what my neighbor did when I lived in Provo, Utah. I want to die of old age, not from a modern illness. All of these health problems I listed above don’t have to happen! We can get rid of them and even prevent them with diet! When you combine eating high fat with low carbs (a LCHF diet) you can be on the way to losing weight. It might take more fine-tuning, which I will explain. Carbs turn into sugar in your blood after you eat them. Then the blood sugar spikes your insulin. Then the insulin drives the blood sugar into your cells to burn. When your body burns sugar it is not burning fat. The insulin keeps the fat stored in your body, so it is not burned. In other words, the insulin keeps your body insulated with fat. Insulin = insulate with fat. So lower your insulin levels by eating foods that don’t spike insulin (fat and low carbs) and then your body won’t make as much insulin. Then your body will be forced to burn fat, and you will lose weight. 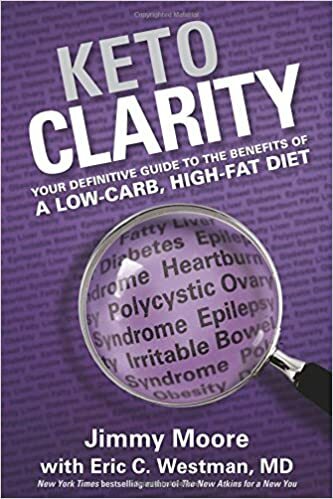 If you don’t believe me, please read this article here by a medical doctor, Dr. Jason Fung, who has cured many people of diabetes and helped them lose weight by putting them on a LCHF diet. In that article he explains that insulin is the master hormone that controls whether your body burns fat or sugar. In other words, if you are fat, it’s not because you have a calorie problem, it’s because you have a hormone problem. Your hormones (insulin, but also others, like leptin) are out of balance. So what do I mean by low carbs? I mean so low that you eat a ketogenic diet. That means measuring your carb intake so it’s 25 grams or less a day. Maybe even 20. So that means reading labels, writing down everything you eat, and doing the math to make sure you don’t go over. To some of you this may sound annoyingly tedious, but I promise you, it is worth the effort, if you want to lose weight. If you try it for a week and it doesn’t work, then you probably need to count your protein grams as well. That’s because protein can turn into sugar by the body, in a process called gluconeogenesis. So….take your ideal weight, and convert that into kilograms. Then eat 1 gram per kilogram of ideal body weight. I got this information from the following book. Guess what?! You can supercharge/speed up the results of a LCHF diet by combining that diet with IF (intermittent fasting). I tried the keto diet about three years ago and I could never get it to work. I think it’s because I did not count protein and was eating way too much of it, so it turned into sugar. I didn’t follow the guidelines in the book exactly enough. I also didn’t know at the time the power of combining the keto diet with IF. I testify that combination works!!!! After last month where I indulged in some high carb days to celebrate two kids’ birthdays and my wedding anniversary, my weight started to creep up. I also was dying to test out a new recipe from Melissa Richardson’s 2nd Natural Yeast cookbook for totally wholesome chocolate chip cookies, so I did finally, and enjoyed them! Apparently, my body is super sensitive to all carbs, still, after my huge weight-loss journey. (When I was celebrating these days I wasn’t eating white sugar, but desserts made with sucanat and real fat, and more protein than I normally eat.) I wasn’t stuffing myself but I was still gaining weight. I think it’s because my metabolism is super sensitive to carbs and reacts with too much insulin. One of my new favorite pair of pants didn’t fit any more. I think it’s because my metabolism is super sensitive to carbs and reacts with too much insulin. Also because I perhaps I still have dulled insulin receptors. Sigh! I don’t know if I will ever be able to eat carbs, even whole sweeteners like honey and fruit, with abandon and not gain weight. I have a feeling that my metabolism is still damaged somewhat, because of genetics and probably eating too many carbs for decades. I lost 70 lbs in 2015 and I worked hard to do that, so I am determined to stop any weight creeping back on. I still have to be careful and accept the fact that I can’t eat whatever I want, whenever I want. I’m OK with that, though, because I love my new, slimmer body! 2. Ate moderate protein by counting protein, according to what it says in the book, which is to convert your ideal body weight in pounds to kg and then eat 1 gram of protein per kg. 3. Followed the hunger/fullness scale and stopped eating at Level 5, “content.” I finally figured out what that feels like for my body. It feels like being 3/4 full. It’s super important not to eat to fullness when eating high fat, if you are wanting to lose weight. When you start to maybe feel full, you are probably at 3/4. At that point, I would tell myself to stop, and set a timer for 20 minutes, and then drink warm water. Then I would distract myself with reading or writing. When the timer went off, if I still felt halfway hungry, I told myself I could eat. But guess what? I didn’t feel hungry any more, because my food had started to digest. 4. Practiced IF by fasting breakfast and lunch every day. Starting at 4 PM, I ate LCHF until 7 PM, and kept within the other guidelines above. By following the four points above, I lost 9 lbs in 7 days! It was hard, but very doable. As long as you are cleared by your doctor to fast (please don’t do it if you have any type of eating disorder) I recommend following Dr. Fung’s info on fasting here. The hunger comes in waves, and by drinking lots of warm water, and distracting myself with my good activities, I did it. (I did get grouchy towards the end, I admit!) I feel like I have made a major discovery! I did IF again this past week, for one day, as I drove home from Utah to AZ, but this time I ate breakfast (LCHF- spinach cooked in bacon grease and sausage) and then fasted lunch and dinner. I had lost 2 lbs. by bedtime. Then I weighed myself in the morning and I lost 2 lbs while I was sleeping! So I lost 4 lbs in one day! I can now tell when my body is burning sugar or fat. This is amazing! So…if you have struggled with weight loss and really want it, I recommend a combination of the ketogenic diet and IF. The best part is that eating high fat feels good and you don’t have to feel deprived. High fat will turn off the carb cravings, and you won’t have to white-knuckle yourself through a day of dieting. Now I know that whenever I hit a certain weight, I can follow the above points and stop the weight creep in its tracks! Of course, it’s ideal not to have the weight creep up at all so I think that means eating fewer carbs even on celebratory days, at least, for me. Maybe I will have a bacon and eggs cake for my birthday, LOL! I highly recommend you listen to these two podcasts by a podcaster who lost 140 lbs eating LCHF. The first one, here, Primal Potential Episode 7, is about eating LCHF and when to eat carbs. The timing and amount of carbs is so important. The second one, Primal Potential Episode 9, is about carb spillover. I highly recommend listening to all of Elizabeth’s podcasts. She has mastered how to lose fat naturally! See primalpotential.com. The even greater news is that turning your body into a fat burner isn’t just for losing weight, it can also help with mental illness. So here are some benefits from fasting. You can learn all about therapeutic fasting and tips on how to do it here. Be sure to read the whole series of blog posts on fasting linked at the end of the post, from Dr. Jason Fung’s blog. You can also learn about it in his book, pictured below, In Appendix B. If you want some accountability and coaching to give you time-tested principles to help you apply my rules, please consider taking my next Eternal Warriors Healthy Eating online class. Go here to learn all about it.